Next week, fans heading north to the big NASCAR weekend at New Hampshire International Speedway will have the chance to make a pit stop in Stafford for some wild short track action. The track is planning their July 13th Carquest Extreme Wednesday race with plenty of star power. The event will feature several open wheeled divisions. NEMA Midgets, winged ISMA Supermodifieds, Pro Four Modifieds and a special USAC Silver Crown Exhibition race will be a part of the racing card. 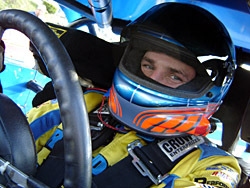 ARCA driver Erin Crocker will enter the NEMA Midget portion of the show in a ride from Seymour Enterprises. Bobby Santos, III will return home with his USAC Midget team and USAC’s Mike Lewis also plans to enter the NEMA show. Loudon, New Hampshire will be the place to be late next week when it comes to NASCAR Touring racing. The NASCAR Whelen Modified Tour and NASCAR Busch North Series will both run Friday afternoon features on July 15th. For information on how to get tickets for the NHIS races, please visit www.nhis.com or call their guest services department at (603) 783-4931. Eric Beers hauls out of Pennsylvania to chase the NASCAR Whelen Modified Tour, so when the series makes their one stop for 2005 in his homestate, you would think that he would have an advantage right? Johnny Clark got a call with some good news earlier this week. On Tuesday, he found out that he was one of 25 finalists selected by Roush Racing for their upcoming “Gong Show” to decide on a driver for in the NASCAR Craftsman Truck Series next season. The entire process will be the basis for a 13-episode television program on the Discovery Channel this fall. Clark said that since the story broke, his phone has been ringing off the hook. An article about his selection appeared in Wednesday’s Portland (ME) Press-Herald and the attention that Clark has received around home has been great. However, Clark is trying to brush that all aside and get ready for this weekend’s PASS event at Unity Raceway. Like a throwback to the good old days a racing, a major open Modified show has been announced for July 20th at Seekonk Speedway. The 100 lapper is not a points event for any one series, but will be officiated by the True Value Modified Racing Series. The purse for Wednesday night show is a healthy one - $10,000 to win. Rules for the event also allow SK Modifieds to compete with a four-barrel carburetor. Since handling is much more important than horsepower at the tight one third mile oval, it’s likely that a SK Mod with the right set-up could very be competitive in the race. The starting field for the event will be 24 cars. Getting picked was quite an honor. Over 1,600 drivers applied for the openings. Clark had spoken with fellow Mainer Ricky Craven, current driver of the Roush #99 truck, through the process. It was a humbling experience for Clark to deal with a driver who he watched go from the short tracks of Maine to the top levels of NASCAR. 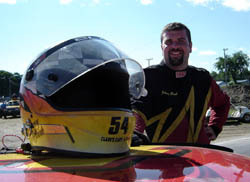 Guess again, Beers has no racing personal racing history at Jennerstown Speedway. In fact, it’s not even that close to his Eastern Pennsylvania home. But don’t rule out the fact that Beers will have a good run there regardless of how new it is to him. Many True Value Mods will be running at Seekonk. Whether you are out west or downeast in the Northeastern coordinator this weekend, there will be plenty of racing to take your pick of. Friday night brings the NASCAR Busch North Series at Lake Erie Speedway (PA) and the True Value Modifieds at Lee USA Speedway, while Saturday night the PASS Pro Stocks are at Maine’s Unity Raceway and the NASCAR Whelen Modified Tour is making the trip to Western Pennsylvania’s Jennerstown Speedway. 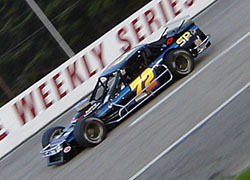 Speed51.com is taking the eastern swing of Modified and full fendered racing and will have the stories from TVMRS at Lee and PASS at Unity for you right here.